Mom's Gone Bronson! : SodaStream Fountain Jet Review! It was back in the late 80s, early 90s that I was first introduced to the concept of the SodaStream – a machine that allowed the user to carbonate water at home in order to create their very own soda without having to leave the house! Flash forward 20 years and SodaStream (already over 100 years in the making) is just as relevant today as it ever was, but now comes topped with various sleek, stylish and up-to-date designs to suit any modern kitchen and appetite for fizz! The SodaStream, whose basic concept is still the same, works by shooting carbon dioxide gas from a compressed bottle out through the SodaStream and into cold water, with the sole purpose of making it wonderfully bubbly! The CO2 cannister screws tightly into the machine within seconds and is easy to swap over when it runs empty. Cannisters can be purchased at local grocery stores and you can trade in your empties for a little money off the new one at the time of purchase, which means no bottle waste AND a discount! Further more, you will find that you also decrease the amount of bottled soda or canned soda purchases made once you start making your own, and thus contribute less environmental waste or recycling too! You can also flavor your soda to suit your taste AND there are a vast array of fabulous flavors to choose from! Personally, holding so many fond memories carbonating my own soda as a child, I of course jumped at he chance to try out the SodaStream Fountain Jet and could not wait to hear that familiar buzz, try the most recent flavors AND on top of it all, share the fun experience with my own children! I just knew that they would love it! To my delight, when the machine arrived on my doorstep, it was everything I had remembered and more! The look and feel of the Fountain Jet says style and usability and was set up in my kitchen and ready to go in just a few moments! It felt like Christmas had come early and I was first in line ahead of the rest of the family to try it out!! Now, the Fountain Jet comes with a re-inforced plastic bottle specifically designed to withstand the pressure from the gas injected into your water. Once filled [with cold water], the bottle is inserted into the machine with a twist to hold and the button on top is pressed with several short, sharp bursts until a little buzzing noise is heard, indicating that there is now enough gas in your water and you’re ready to go! You pop out the bottle with a fizz that sounds as though you’re opening the door of a time-travelling DeLorean, etch yourself a cheeky smile and head for your flavor of choice, of which there are many to choose! In our house particularly, the instant favorites have clearly been Cola Free and Root Beer along with Orange and Lemon/Lime. SodaStream have something for everyone though and you can find anything from Ginger Ale to Orange to Energy Drinks and SodaSteam’s MyWater Flavor Essences, which allow you to add just a drop of flavor to your water rather than a full blown soda, if you’d prefer – these went down very well in our household also! After having tested out the machine now for a couple of weeks, I am happy to say that SodaStream is still just as fun and accessible now as it ever was and the flavors vast and adaptable to suit your taste! The machine is easy to clean and easy to store if you’d like to put it away, although it makes a perfect addition to any counter-top as a stylish appliance in its own right and the whole family can enjoy its application! In fact, it is almost addctive and SO much fun! The price of the machine and the individual flavors are a little on the expensive side, but the cost easily covers what you get for the money and in the long run should allow you to see a saving if you are a regular soda drinker. Of course, the SodaStream syrup bottles will need to be disguarded with after they’re empty, but they are fully recyclable and will cause a LOT less waste than if you were to throw away the bottles and cans from from the pre-packaged soda you might buy at the store. If you are artsy, you can also use the lids from your syrup bottles for paint cups or children's art projects, thus not having to dispose of those particular pieces at all! You can transfer your soda to any container after it has been carbonated, but you MUST use the machine responsibly and only use the SodaStream bottles that are provided with it whilst injecting CO2 into your water. These bottles are specifically designed to withstand the pressure and you have to put safety first before cost. These bottles are a tad expensive to replace but, again, they are well worth the money and should last you a long while, when and if used correctly. Overall I am giving the SodaStream Fountain Jet a whopping 9/10 as it just screams fun, style and likeability for the whole family! Certainly a fun extra to put on your Christmas list and something you certainly will not get bored of in a hurry! I know we will be using ours for a very long time to come! ***Disclaimer: All images and model names are the property of SodaStream and I am not associated with the company in any way! I was not monetarily compensated for this review but I was provided with a SodaStream Fountain Jet. Such provisions have not influence any of my opinions in any way and all thoughts expressed herein are my own. Thank you! Great Review!! we have this machine and LOVE IT!! I hope everyone reading this goes out to grab one! They save you a ton of $$$ if your family are soda drinkeres and even if they arent the water flavors and crystal light flavors are AWESOME!! I love that the soda stream has so many options for flavors, really, Its the best thing ever. Thanks for the review, I love the picture of all the flavors you have lined up next to the machine. 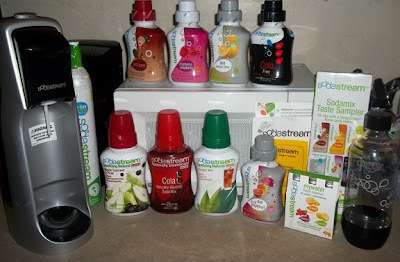 Awesome review and I absolutely love the Soda Stream. Took me a while to find the flavors I liked but it was so worth it. I'm a big fan of the sodastream myself. I love the options of flavors and i love that I can have sparkling flavored healthy water any time i choose. I do agree that the this thing and its parts aren't remotely cheap, but i think the durability will prove nice. Great review! Great review,I am getting this machine soon and can not wait to have pizza/root bear floats movie night with my daughter. Really great review of such a cool product! I love our SodaStream and I think I'd be lost without it. We use it to make Italian soda's even. SodaStream has such an array of flavors that it's one of those kitchen must-haves. Very cool! I had the chance to try out Soda Stream at BlogHer. Too cool. Excellent review! I would love to have one of these, they are so neat! This seems so cool! Homemade soda FTW!